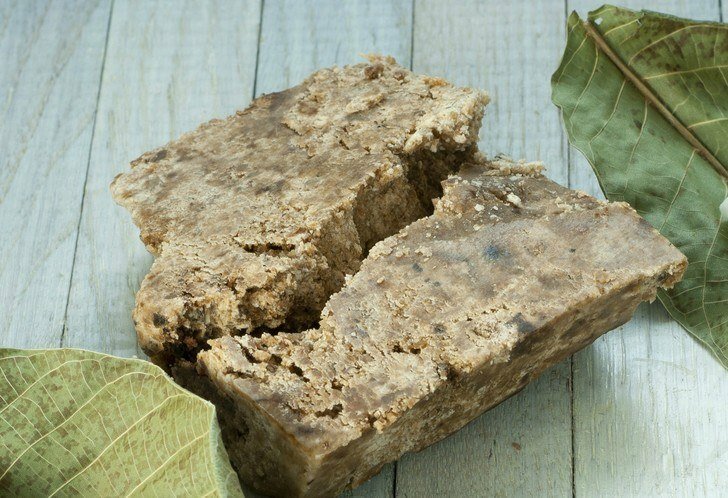 Shea Butter, with its slightly smoky smell and silky feel on the skin, is extracted from the seeds of Vitellaria paradoxa tree native to West Africa. It is a godsend for the people of this region who have been using it for cosmetic, nutritional, and medicinal purposes for thousands of years. They use it to protect their skin and hair from the drying effects of Sub-Saharan climate. There’s evidence that it had played an important part in the beauty regimen of Cleopatra of Egypt in the first century BC. Shea butter is still extracted manually by a painstakingly long process that involves the collection, cleaning, segregation, drying, and pounding of the dried nuts into a paste. The fat-rich seed paste is then mixed with water and agitated by hand to separate the butter which rises to the top in the form of curd. This top layer is collected, and then purified by melting it into butter oil and then filtering it out and cooling. The resultant butter is off-white in color and may contain brownish specks unless the filtering process is not meticulous. It is best to choose the natural product over the refined ones although it may not look very appealing and may have some tiny bits of the seeds. But it is as natural as you can get. If the characteristic smell doesn’t appeal to you, bleached and de-scented butter may serve your cosmetic purposes. But such chemically extracted and refined products may not offer all of the health benefits Shea butter is known for. Two fatty acids oleic acid and stearic acid constitute the major part of Shea butter. The stearic acid content can be as high as 30-50%, making this vegetable butter very similar to animal fat. That could be one of the reasons why it is readily absorbed into the body and functions as a refatting agent. It has some amount of linoleic acid and linolenic acid too, both essential fatty acids which offer some additional nutritional benefits. Want to try the highest quality Shea butter for yourself? Pick up some 100% Pure, Unrefined, Organic African Shea Butter from Ghana from this page on Amazon. The butter remains solid at room temperature, but melts on the skin to form a non-greasy coating that effectively seals in the moisture. When West Africa is plagued by the cold and dry Harmattan winds that blow from the Sahara desert, the local people smear themselves with Shea butter to protect their skin from drying out. Applying Shea butter all over the body after a bath or a long swim will help keep the skin hydrated and soft. Alternatively, you can add a tablespoonful of the butter into your warm bathwater before the final rinse. It will quickly melt and cover your body with a thin, protective layer of oil, but the best part is that it does not make the skin oily. Shea butter may not replace your sunscreen, but it can provide some protection against UV exposure. Shea butter has been estimated to have a sun protection factor of 6 (SPF-6). It may not be sufficient for full sun exposure on a summer day, but may be enough for a quick trip outside when the sky is overcast. With rising concerns about the possibility of chemicals in sunscreens themselves causing skin cancer, it may be a good idea to apply Shea butter as a base coat before applying another sunscreen on the skin. The anti-inflammatory action of the butter is even helpful in reducing burning and soreness after sun exposure. Make your own long-lasting lip balm with Shea butter. Since it is nearly solid at room temperature, you don’t have the hassle of melting beeswax or have to use petroleum products as a base. Shea butter will keep the lips moisturized, and the vitamin A and E in the butter nourishes the tender skin and keeps it healthy. To make the simplest of lip balms for everyday use, add 2-3 drops of peppermint oil or any other essential oil of your choice to a tablespoonful of Shea butter and whip it up. Fill into a small container. If you want a more solid lip balm in stick form, add Shea butter to equal amount of beeswax melted over a double boiler. Add natural pigments such as beetroot powder for some color. Shea butter has higher stearic acid content than other vegetable oils, making it much closer to animal fats in chemical composition. The elasticity and suppleness of the skin is maintained by the structural protein collagen that binds the skin tissue together. Loss of collagen due to aging and sun exposure is the main reason for skin wrinkles. Dehydration of the skin aggravates wrinkles further. The fatty acid profile of the butter allows it to be absorbed into the deeper skin layers to nourish them and support collagen production. The humectants action of the butter helps restore hydration of the skin layers, making them more turgid and visibly smoother. Regular application protects against moisture loss from the skin. Being non-sticky, Shea butter can be comfortably used day and night. It is a non-toxic way to protect the skin from regular sun exposure in day to day living. Stretch marks formation depends on heredity and other factors such as rapid weight gain and larger tummy from a larger baby or excess amount of amniotic fluid. However, keeping the skin moisturized will reduce stretch marks, if not completely prevent them. Since many chemicals can be absorbed through the skin, it is best to depend on natural, non-toxic moisturizing agents like Shea butter for keeping the skin hydrated all through pregnancy and during the lactating period. The breakdown of the dermal layer due to overstretching is the cause of the slightly depressed feel of the stretch marks. The fatty acids in Shea butter being similar in composition to skin fat, it may help nourish the dermal layer and make it more elastic by promoting collagen production. Regular application of Shea butter on the stomach, thighs and breasts well before they come under severe stress may be the key to avoid stretch marks. Shea butter contains several anti-inflammatory agents such as cinnamic acid, but the lupeol cinnamate found in the butter is known to reduce skin inflammations. Since the butter can penetrate deep into the skin layers, it may help reduce the inflammation and normalize the skin faster. Shea butter works wonders when applied around the eyes. It gets rid of under eye bags and makes the area smooth, removing dark circles in the process. Spot application on acne may help in some cases, but people with generalized skin inflammation, as in the case of rosacea and dermatitis, find relief from regular use of Shea butter. It is effective against other skin inflammations that result from tanning, scalding, frostbite etc. Shea butter’s ability to soften frizzy hair and make it more manageable has been long exploited by people of its native land. It can be used to just coat the strands of hair or massaged into the scalp. When Shea butter is applied on the hair, it prevents the hair from drying out and becoming brittle, a common problem in hot, windy conditions. It seals in the moisture by coating each strand of hair in a thin, non-greasy layer of fat. To apply to the hair, take a teaspoonful of Shea Butter and rub it between the palms. When the butter melts, spread it over a small portion of the hair using both hands. Repeat until all hair is covered. Run a brush through the hair to ensure that every strand of hair is covered. When massaged into the hair, Shea butter helps relieve many scalp problems such as dandruff and cradle cap in infants. It can be used whether your scalp is dry or oily. On oily scalp, it helps reduce excessive oil production by the skin glands. It can moisturize dry scalp and reduce flaking due to dryness. A great advantage of Shea butter is that it doesn’t leave the hair greasy. Also, it can be easily washed off afterwards. Take a small amount of Shea butter on the palm of your less frequently used hand. When the butter melts, dip the fingers of the other hand in the liquid and apply on the scalp, rubbing it in. The oil gets absorbed almost completely. Regular application twice or thrice a week will help promote healthy hair growth. Even if you are not using the butter regularly for moisturizing the hair or the scalp, you can make use of its protective effects when you step out of the house. Just take some butter and rub it between the palms and smooth your hair with it. Shea butter with its SPF of 6 affords quick and easy protection from the damaging action of sun exposure. The butter acts as a barrier to the chemical pollutants in the air as well. Shea butter is generally hypoallergenic. But, as in the case of any substance applied to the skin for cosmetic or therapeutic purposes, it should be tested on a small patch of skin before using it more generously. The natural aroma of unrefined Shea butter is often described as being nutty or smoky, but it may be offensive to some people. Shea butter lends itself to the addition of fragrances, and is a good carrier for essential oils. It is a suitable base for making skin creams and lotions of different textures since it blends well with lighter oils like coconut oil. When massaged into aching joints and inflamed areas, Shea butter provides relief. This makes the butter highly useful to people suffering from arthritic and rheumatic pain. Essential oils such as lavender, roman chamomile or Helichrysum may be mixed into the Shea butter to make it more potent. Muscle soreness resulting from exercise, sports practice, or other strenuous activity may be relieved by massaging in Shea butter. Triterpenes in the butter may even accelerate healing by relieving inflammation. Applying Shea butter both before and after exercise has been found to provide faster pain relief. For best results, unrefined, organic Shea butter should be used. People in Nigeria have been known to use Shea butter to relieve nasal congestion. It may help relieve sinus congestion too. In an experimental study that tested Shea butter, petroleum jelly and the standard nasal drop Otrivin for their effectiveness in relieving nasal congestion, Shea butter seemed to have a more lasting effect of 5-8 hours, although it took up to a minute to clear up the nasal passage when applied to the mucosal lining. The medicated nasal drop was quicker in clearing up the nostrils, but the blockage returned within 2- 4 hours. More importantly, repeated application of the nasal drops resulted in nasal irritation and rebound congestion. Petroleum jelly didn’t make much of a difference at all. Shea butter has been traditionally used to treat insect bites. Spot application quickly takes away the stinging pain. Severe itching and scratching often worsen insect bites because it helps spread the poison to the surrounding tissues. The anti-inflammatory property of Shea butter reduces itching and soreness. It can be used to treat mosquito bites and honey bee stings. It is even effective in treating Jellyfish stings. When you go for trekking or camping, Shea butter is quite handy to have. Apply it over exposed parts of the body to ward off biting and blood sucking insects. If it is not as effective as chemical insect repellents, it is definitely much safer, especially when repeated use is necessary. When buying Shea butter, it is important to choose unrefined, raw Shea butter. This 100% Pure, Raw Unrefined Shea Butter from Better Shea Butter is consistently regarded as the best available to buy. It is packed with thousands of five star reviews and is priced very fairly. You can purchase it from here on Amazon.